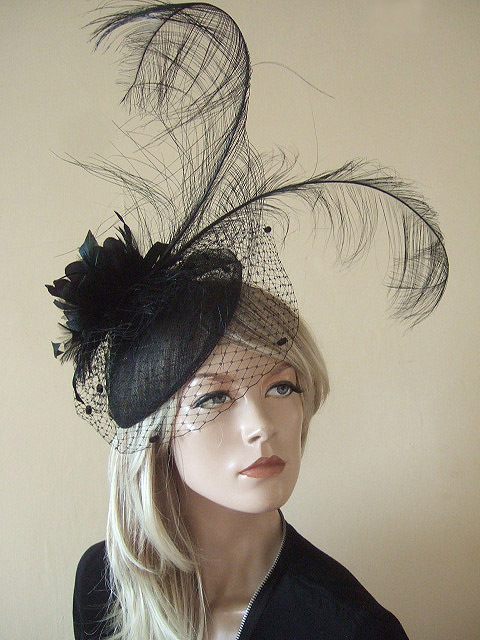 Fantastic Sinamay Fascinator, with Long Twisted Ostrich Feathers, Small Merry Widow Veil, and Black Silk Flower at the Back. Fits all head sizes, so an easy option for those that are unable to try in advance of booking..
£25.00 per day, plus £50.00 deposit refunded on return. Fits all sizes, by thin Black Alice Band around the head. Base measures width 7" x 9"
14" from lowest point of sinamay to tip of feathers.